Finally in 1980 after further meditation and research he developed his own method of rod taper design. It was not based on designing rod tapers absolutely from scratch, but making changes to basic rod tapers that were known and tested. He called it "rod design by controlled modification" and it finally turned out to be a great success. Probably the best method to end up with a rod that has the characteristics and taper that the maker wanted to have. During the following 7 or 8 years he never duplicated a rod he made in order to thoroughly test and verify his method. The results were as anticipated. 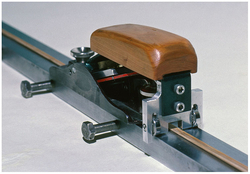 He published his method of controlled taper modification in detail in articles in the Planing Form newsletter, issues #7 and #45. With the assistance and programming skills of his friend Bill Yonge of Vancouver he ended up with a very usable computer program that spits out taper data sheets for making excellent fly rods. While talking about verification... As a byline I might add a coincidence that made John and I chuckle and served as a basis for further pondering and lengthy discussions in his workshop. Some time in 1987, I was also dissatisfied with the so far established "standard" design methods for rod tapers and ended up with developing my own. At that time I had never heard of him and vice versa, so on that first stay in B.C. in 1992 when I explained to John what I did, it was quite a surprise. My own method was also based on modification of existing time-tested tapers and proved to be equally successful. Although we independently started out from different starting points, John from Garrisons calculations and I from a graphical design method that I computerized, we essentially ended up with the same method, which was a great confirmation for both of us. A long line of rods proves it. Many of John Bokstrom's early bamboo fly rods were designed for the kind of fishing he used to do the most in his provinceÃfly fishing for steelhead on such beautiful rivers as the Bulkley, the Dean, the Thompson, and the Skagit in Washington state. He built rods up to 9 feet in length to cast 7 to 8-weight lines. "Believe it or not, if the taper is right, bamboo rods like that can be fished all day without strain..." he once told me and he is absolutely right. Now back to one of John's most significant feats, the aforementioned and meanwhile legendary Rodbuilder's Meeting at Corbett Lake. It all began when he and Don Andersen, a well known bamboo rodmaker from Rocky Mountain House, Alberta, met for the first time at Corbett Lake Country Inn in May of 1987, purely by accident.